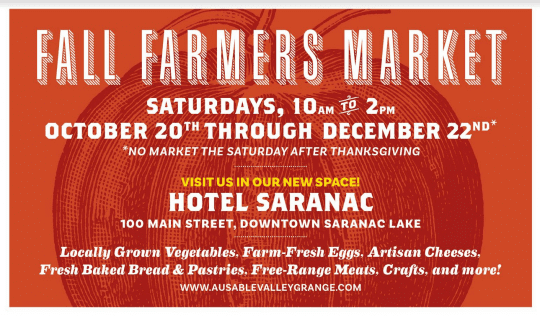 The AuSable Valley Grange Farmers’ Market, a producer-only farmers’ markets in the eastern Adirondacks, has partnered with Hotel Saranac for its annual fall market in Saranac Lake. 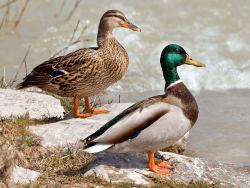 The market will be held every Saturday at Hotel Saranac from October 20 to December 22 from 10 am to 2 pm (with the exception of Saturday, November 24, following Thanksgiving). The market is making the move from Historic Saranac Lake’s John Black Room where it was hosted in 2017. Seasonal offerings at the AuSable Valley Grange Farmers’ Markets include fresh no-spray vegetables and herbs; farmstead goat cheese; fresh apples and pears; artisanal cheese and fresh yogurt from grass-fed cows; free-range chicken and egg; grass-fed beef and pork; fresh-baked breads and pastries; ready-to-eat soups, snacks, and beverages; maple syrup; hand-carved bowls and utensils; artwork and crafts. The AuSable Valley Grange Farmers’ Markets will also continue to accept SNAP benefits at the fall market. SNAP offers nutrition assistance to millions of eligible individuals and families and provides economic benefits to communities. SNAP is the largest program in the domestic hunger safety net.